This tour is the best opon to get an idea of the size and beauty of Marau Peninsula. The third largest bay in Brazil brings together a multude of islands, beaches and rivers. To know it, you can rent one of the boats that leave from Barra Grande port or we can arrange for you a private boat. The path passes by the islands of Goró, Goió and Sapinho and in restaurants where you can eat seafood and watch the sunset. See our prices. Visit Holed Stone Island is an amazing opportunity to be in the midst of unspoiled nature. In addion, there you will be able to observe a curious peculiarity of the site, which is its exoc rock formaon. This is because the ground is covered with gravel and stones are all, in fact, holed. 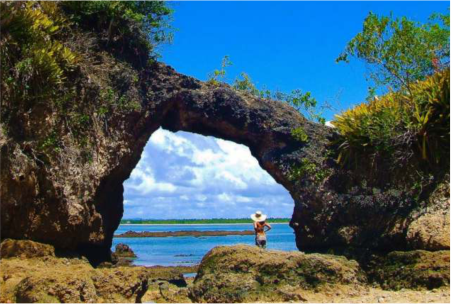 A highlight is a natural stone arch, which was shaped by the blue waters that hit hard on the small island, and today houses an image of Yemanja. The tour lasts about 2 hours. See our prices. Only the path itself is already a tour worthwhile. 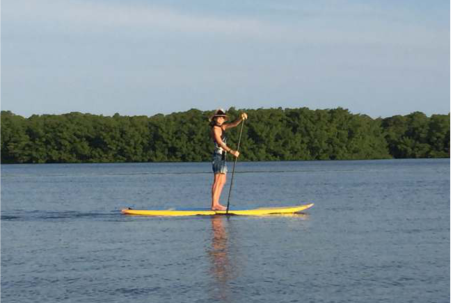 During the journey, you will be able to observe the vegetaon of mangrove and know the other side of Barra Grande. 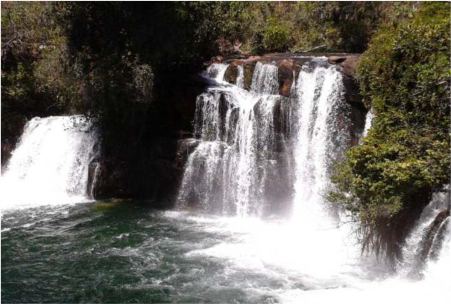 Upon arriving at the waterfall you will come across a natural phenomenon that is unique in Brazil: there water falls to 5 meters high and from there run directly to the ocean. And there is also a delighul surprise! The boat park right under the waterfall and already there you will be able to bathe and wash your soul. See our prices. A trip to the Forest of Bromeliads is like a trip back in Ɵme. 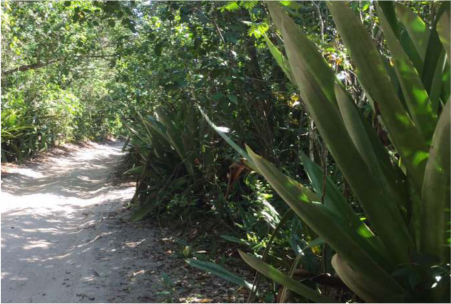 In a 4x4 car, passing through the path between the beach and the Cassange Lagoon, you come to a magical and unique forest, home to bromeliads that reach more than 2m tall. It's as if you were in Prehistory! And this is another phenomenon that, in Brazil, only occurs in the Marau Peninsula. See our prices. 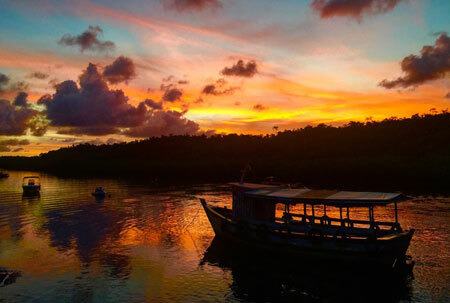 The tour lasts about 2 hours and goes through the peninsula mangrove, discovering the richness of ﬂora and fauna that exist there. For those who do not want to go on a stand-up paddle, a canoe will accompany the guests with a local guide in charge. He will show exoc fruits, climb coconut trees, take coconut water and much more. See our prices. 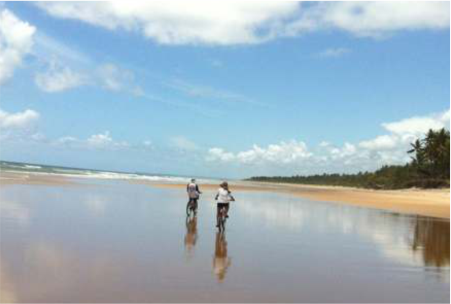 At low de, the wide range of hard sand becomes a real cycle track, making it the ideal environment to get you out riding the peninsula beaches. The inﬁnite horizon, the mirror of water that forms and the landscape full of coconut trees will certainly earn you good pictures! If you want a picnic, please contact us to inform the type of sandwich, juice and fruit desired. We will set up a special basket for the ride. Free service. 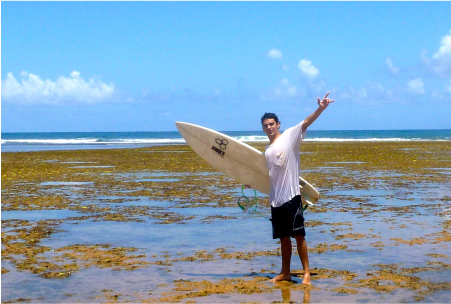 In full or new moon, the low de mornings form clear pools on the coral reefs of Algodões, Arandis and Taipus de Fora. In Algodões, walk 15min to the right unl you reach the beauful natural pools. In Arandis, walk 20mins to the opposite side. 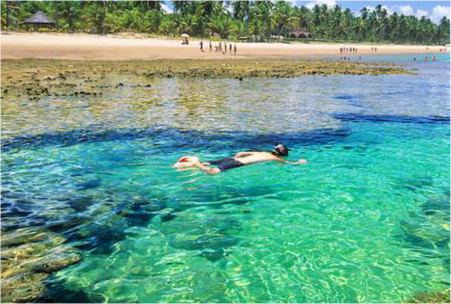 If you are looking for exuberance, Taipus de Fora has the most famous pools of Peninsula. They are about 20 km away and the route is done in 30 minutes. We provide free diving equipment. See our prices. Santa Rita Farm is located 15min drive from Casa dos Arandis. This tour lasts about 2 hours and shows to visitors how is a real farm in the region, with cocoa plantaons, rubber trees and tropical ﬂowers. 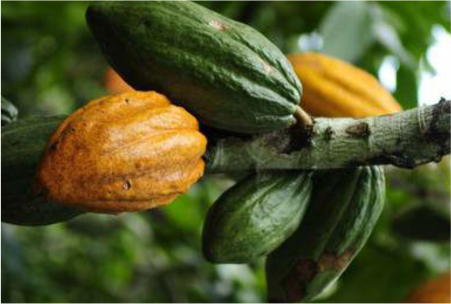 Led by a guide, you will have the opportunity to taste cocoa and try acerola and other typical fruits of the region. And in the end, a delicious snack will be waing for you at a strategically placed table under a mango tree. Simple and charming! See our prices. The ride to this nave Atlanc Forest area is on foot, lasts about 2 hours and is led by Márcio, who, besides being an environmentalist, is a true showman. 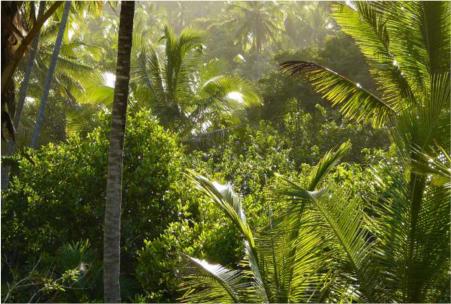 He will show you details of local ﬂora, talk about peculiaries of the region and take you to a self-sustainable agroforestry and a house where it makes a delicious mango with banana ice cream. And more! You will have the opportunity to try the Açaí Juçara, made with the best fruits of the region! See our prices. 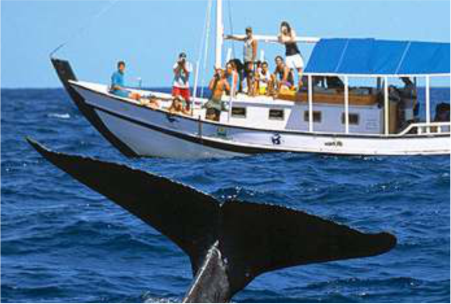 Humpback whales visit the Brazilian coast between July and October, giving us a spectacle of nature, with mothers and babies swimming and somemes skipping a distance of up to 50m of the vessel. Informaon and videos about the lives of whales are shown during the hotel's way to the harbour where the boats leave. The whole tour lasts about 4 to 5 hours and is subject to weather condions. See our prices. 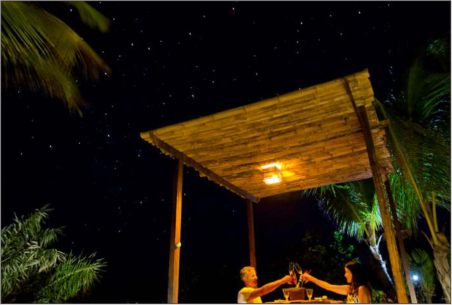 If your desire is a dinner for two, we can prepare it at the kiosk, on the beach or in your own bungalow. All entled to torches and sparkling! And, of course, with dishes deliciously prepared by our chef Tica Magalhaes, with fresh organic ingredients and vegetables from our garden. For this, make a reservaon and we will prepare a menu according to the taste of the couple. See our prices. 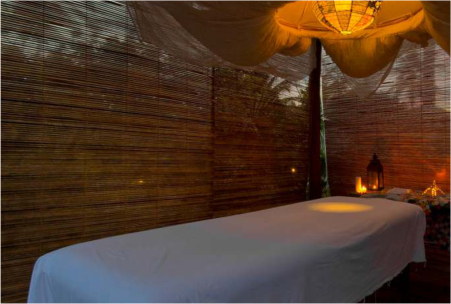 In a beauful bungalow, with the sound of the sea in the background, our therapists oﬀer customised massages according to the needs and preferences of each guest. The techniques applied are based on Ayurvedic medicine and aims to provide a complete and highly relaxing therapy. 1h or 1h30 duraon massages are oﬀered.